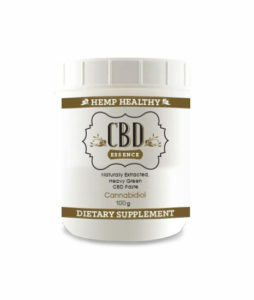 CBD Essence® CBD Oil Paste (partially) Decarboxylated comes from domestic and organically grown industrial hemp plants which have a high CBD content. Always grown in sustainable fashion on clean and fertile tracts of land, then the proper CO2 extraction methods applied. Resulting is the essential ESSENCE of the plant, a wholesome botanical extract of the original plant and Full Spectrum of Cannabinoids, Terpenoids, Essential Oils and other compounds of the original plant, just as nature intended the entourage effect.